Matches are made in heaven, but the journey to find each other was never easy. Nearly 9 years ago, Gurnoor walked past her now-husband in their tuition class and was instantly drawn to his eyes. The rest they say, is history. From being the closest friends and the partners-in-crime to being a happily married couple today, the much in love duo has witnessed it all. 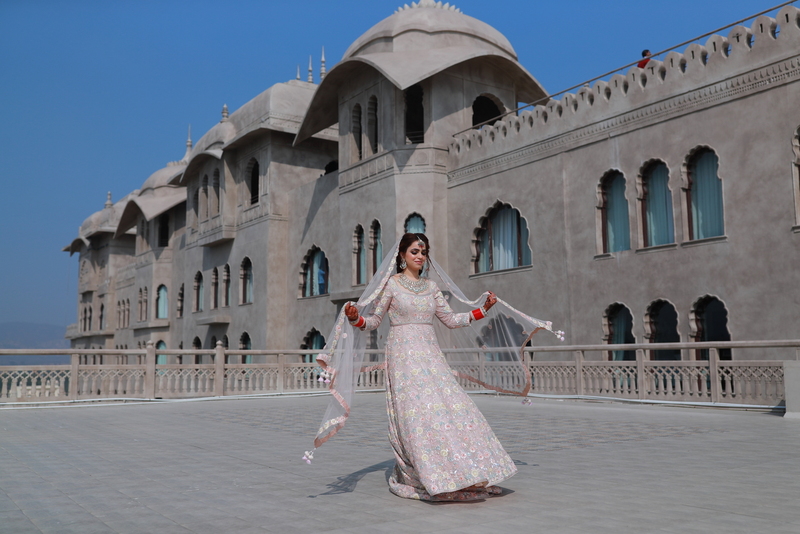 Scroll down to know more about their wedding that took place in Fairmont, Jaipur. Their candid moments of absolute bliss were greatly captured by the Imprint Studio and Amba Studio. Fairmont, Jaipur is awe-inspiring in its architecture. This luxury Jaipur hotel is nestled amongst the majestic Aravalli hills. 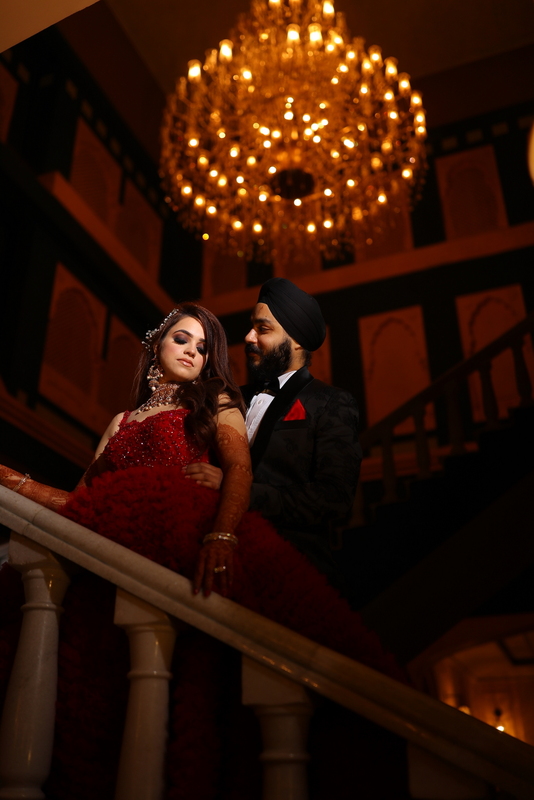 For the couple, Gurnoor and Jasvinder Sahni, a perfect blend of traditional and modern elements were infused in the wedding. The couple embarked on their journey with a ring ceremony that brought the forest indoors with aerial florals in whites and greens. 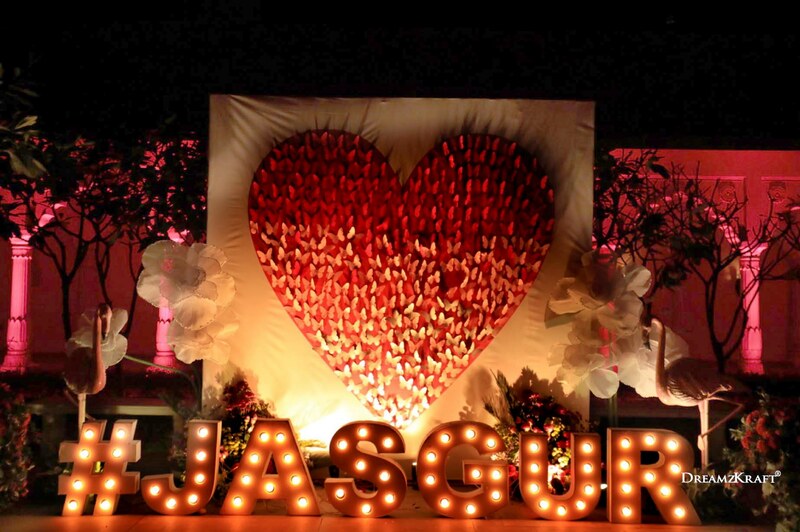 The couple had their hashtag #JASGUR in different styles placed at the venue. 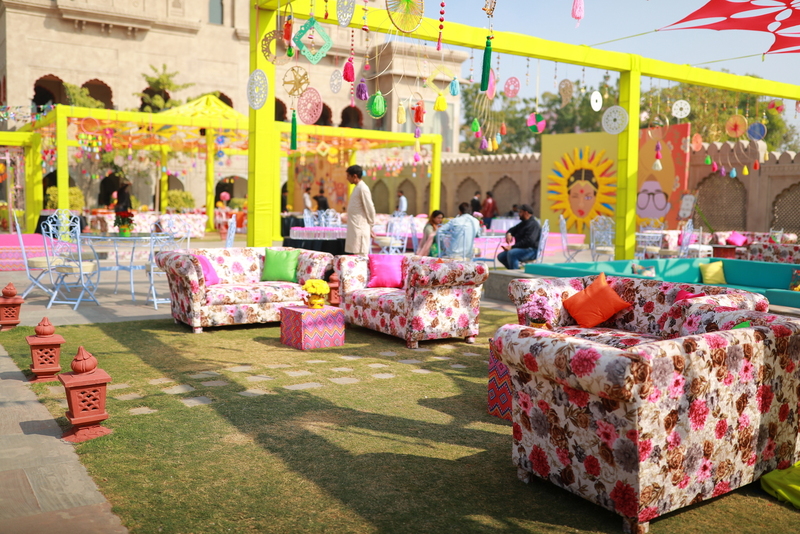 The mehendi ceremony was a colourful and filmy affair. It had a bohemian carnival and kitschy Jaipuri theme to it. 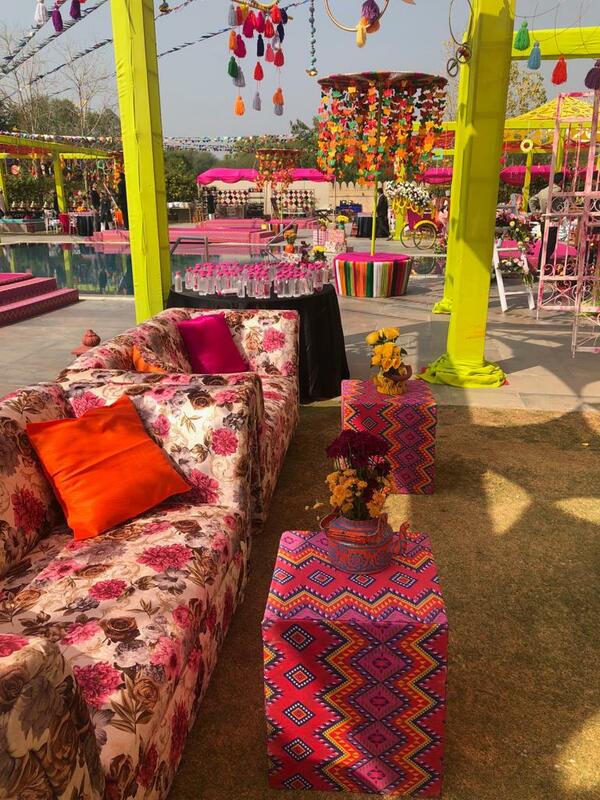 The décor had a lot of bright colours that made the venue look lively and energetic. The bride and groom were no less than a delightful sight to their families, who enjoyed their hearts to the core. The ceremony was duly taken care of by the mehendi artist Kundan Mehendi. 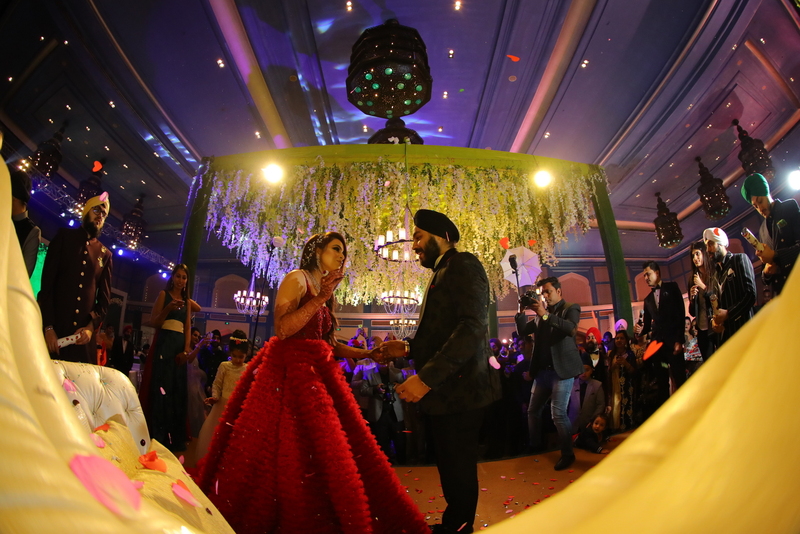 Also, their sangeet was cherished by a wonderful performance by famous singer Malkit Singh and was choreographed by Maggie and Karan. What’s more? The wedding also featured the well-known drum band Loud Street Girls to add more glamour. The inspiration was to have everything in bulk because we Punjabis love everything extra anyway! 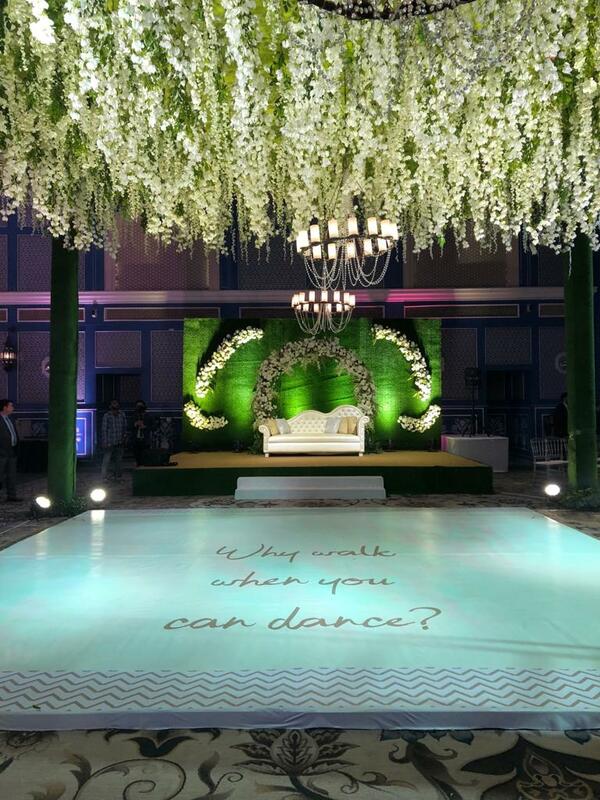 For the wedding, the decor with pastel shades made the wedding look royal and elite. Colours such as peach, pink and white were used in abundance. We both love gatherings and in Punjabi, you call it a ‘Toli’. 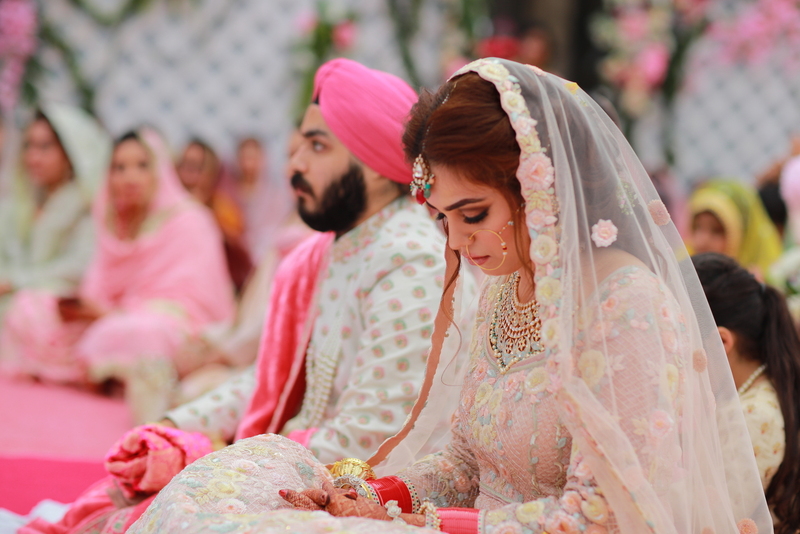 As we always wanted to have a memorable one, so we both decided to have a destination wedding because of the fact that staying, eating, living, dressing up together for the wedding gives room to all the drama, masti and emotions on its own and we Punjabis can’t live without these three! 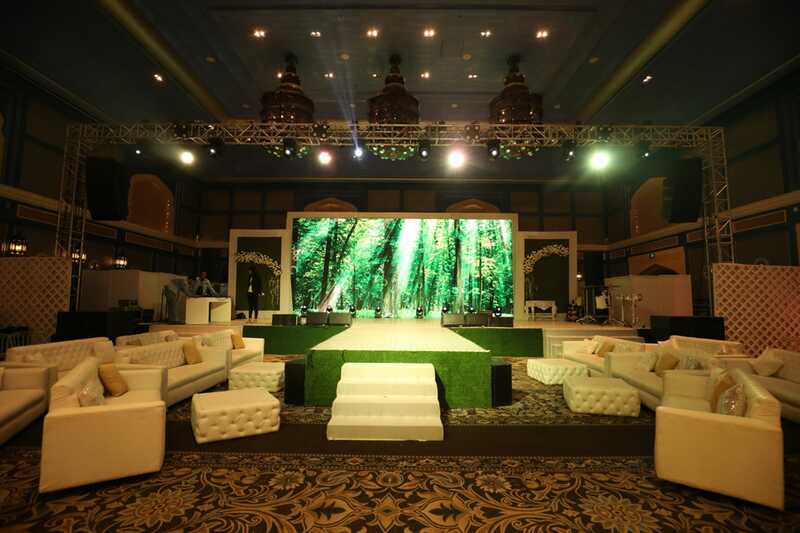 The wedding was amazingly planned, designed and executed by Dreamzkrraft. “Trust me, till today my family calls me not to ask what am I doing but just to tell how great our wedding was. These guys are BOMB in BOM-BAE!! From having a greek engagement, carnival-style-mehendi, a royal cocktail with a touch of delicacy followed by a dreamy wedding, what else could #jasgur ask for? Well, that was the hashtag of our wedding!” says Gurnoor. The alluring bride always wanted to be like Kareena Kapoor who walks in a Manish Malhotra attire, and that pretty much sums up her choice of being classy and elegant. She flaunted Zewarat-e-noor‘s jewellery to give wings to her dreams. Till date, Jasvinder brings a chocolate every day for his beautiful wife Gurnoor. At the time of her Bidaai, both the families shed tears for her- That speaks of the love and warmth that the couple receives from their near and dear ones.